Congratulations to the Clearview Ice Cats PeeWee team! 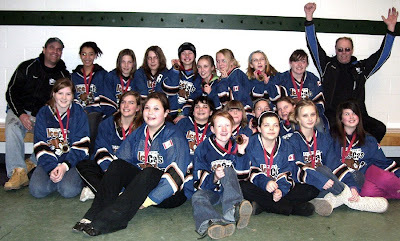 This picture was taken on March 21st after they secured the D Championship in Barrie with a 3-1 win over North Simcoe. Coach Cory Riley and Assistant Coach Steven Ferrari had a fantastic time coaching this full-roster team of 19 girls! More than half the team were new to hockey in the last two years but that didn't stop their determination and team spirit. This team's full stats, including playoffs, are 8-7-6. Those 7 tied games caused lots of excitement on the ice and in the stands! This team played 4 tournaments with 2 ending as Finalists in the Championship rounds. The parents were awesome, the volunteers were fantastic and the girls were tigers. We are looking forward to next year already! If you haven't watched girls hockey, come out and cheer them on. Smiling from ear-to-ear, chanting encouraging cheers—right through the mouth guards—win or lose, is what makes girls hockey special. Know a girl who might like to play?